Emily Walz, Clarklake sophomore, creates her own delicious breakfast food utilizing the waffle machine. This waffle is packed with healthy fruit and divine chocolate chips to make for the kind of breakfast worth getting out of bed for. 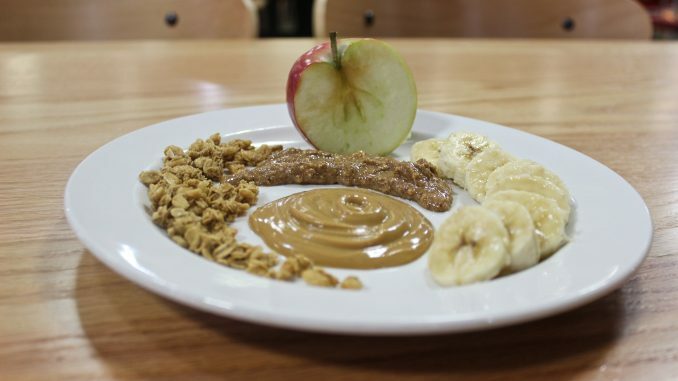 The perfect breakfast for that four minute and thirty second slot in your schedule right before you make the sprint across campus to be on time for your 9:15. Trust me, we all do it. Lemon is so last year. Burst into spring (if Michigan ever gives us one) with a refreshing twist of cucumber. According to Livestrong.com, adding slices of cucumber to your water not only adds fresh flavor but Vitamin K, Vitamin C and Potassium. Macallister Steffenhagen, Naples, Italy, sophomore, recently raved about the salad she came up with on her own one evening at Baldwin. The first word that came to mind when she thought about a name for her salad? Spring. Tip: Sweeten this salad up with raspberry vinaigrette instead! With a Baldwin food station that is constantly grilling, it’s about time we get creative with our burgers. Try toasting your bun in the toaster oven, throwing grilled vegetables in the mix or taking an extra minute to melt the cheese in the microwave (located for student use in the Keller) to get the most flavor out of your burger. Gluten Free? Try adding the rice noodles offered at the stir-fry station! Who needs Qdoba when you could have Baldwin? There is nothing more obtainable in Baldwin than rice so try adding pork (as pictured) or any other meats available that day along with the Mexican toppings for—I am not exaggerating—a burrito bowl better than Qdoba’s. Because of Bon Appetit’s commitment to buying local and fresh ingredients, you can count on this dish to taste light yet scrumptious. *For a healthy alternative, sub Greek Yogurt for sour cream and Quinoa for rice. Why didn’t mom season spinach like this when we were kids? This is my go-to meal at Baldwin. With chicken and baby-spinach made readily available, there is nothing easier than whipping up this healthy and simple-to-make dinner. Toss the baby spinach in just enough olive oil to wilt the leaves, grind fresh salt and pepper over the spinach and chicken and squeeze a generous amount of lemon juice all over to make for this zesty and delectable dish!